Trump announces plan for new "space force"
In remarks that ranged over a variety of unrelated topics, Mr. Trump began by saying current U.S. employment levels were the best "in recorded history" and blaming current immigration problems on the Democrats, saying "we have the worst immigration laws in the entire world" and that ongoing issues could be resolved "very quickly if the Democrats come to the table." "Everybody wants to do it," he said. "We want to do it more than they do. If they come to the table, instead of playing politics, we can do it very, very quickly." 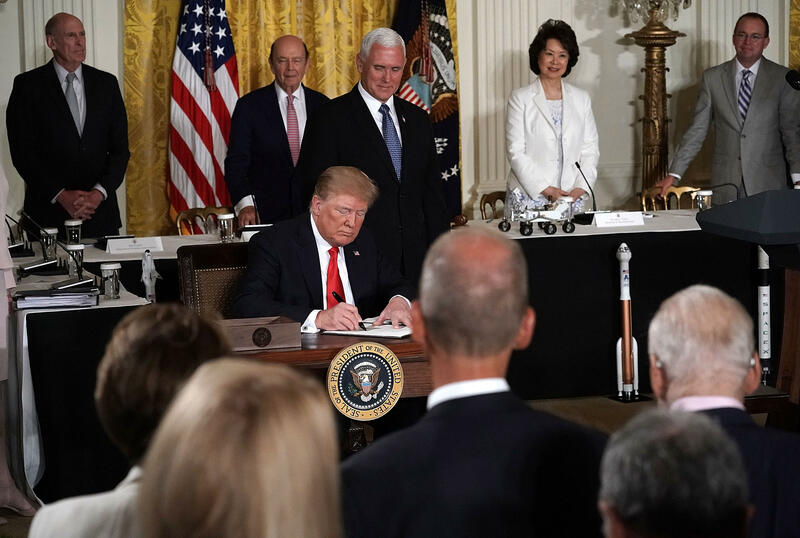 Turning his attention to space, the president praised the National Space Council and its chairman, Vice President Mike Pence, for its work re-focusing national space policy, saying "for too many years, our dreams of exploration and discovery were really squandered by politics and bureaucracy. And we knocked that out." The Pentagon's chief spokesperson Dana W. White issued a statement suggesting the process will take some time. "We understand the President's guidance. Our Policy Board will begin working on this issue, which has implications for intelligence operations for the Air Force, Army, Marines and Navy. Working with Congress, this will be a deliberate process with a great deal of input from multiple stakeholders." In a letter to lawmakers last year, Defense Secretary James Mattis "strongly" urged Congress to reconsider a proposal to establish a separate "Space Corps," saying it was "premature" to set up a new organization "at a time I am trying to reduce overhead." "The creation of an independent Space Corps, with the corresponding institutional growth and budget implications, does not address the specific concerns nor our nation's fiscal problems in a responsive manner," The Hill quoted Mattis. Sen. Bill Nelson, a Florida Democrat who once flew aboard a space shuttle and who is running for re-election, was quick to object Monday, tweeting his take on Mr. Trump's remarks before the National Space Council meeting even ended. "The president told a US general to create a new Space Force as 6th branch of military today, which generals tell me they don't want," he wrote. "Thankfully the president can't do it without Congress because now is NOT the time to rip the Air Force apart. Too many important missions at stake." In any case, Mr. Trump signed Space Policy Directive 3 and then left the room, leaving Pence to manage the third public meeting of the National Space Council. Jim Bridenstine, NASA's new administrator, told the council the civilian space agency is working to implement Space Policy Directive 1, which calls for astronauts to return to the moon as the nation's next major space objective. NASA is developing concepts for an orbital "gateway" space station circling the moon that would serve as a base of operations, a technology testbed and a jumping off point for future flights into deep space. "The goal is sustainability," Bridenstine said. "We do not want this to be 'Lucy and the football' again. When we go to the moon, we're going, as the president said in his speech, this time we're going to stay. The gateway gives us that great opportunity. "It's also important to note that as NASA develops these capabilities, each one of these capabilities feeds forward. The reason we go to the moon is we want to land Americans on the surface of Mars. The technologies, the capabilities, the in situ resource utilization that we develop for the moon will ultimately get us to Mars." The council then heard from two panels of experts who all agreed with the current plan to send astronauts back to the moon as the immediate goal of America's human space program. But Terry Virts, a veteran shuttle astronaut and space station crew member, argued against building a gateway similar in concept to NASA's current space station. "It essentially calls for building another orbital space station, a skill my colleagues and I have already demonstrated on the ISS," Virts said. "Gateway will only slow us down, taking time and precious dollars away from the goal of returning to the lunar surface and eventually flying to Mars." "Most importantly," he added, "any future exploration plan must be bipartisan. Unless these efforts are truly bipartisan, from the beginning, they will be doomed to eventual cancellation. You see, getting back to the moon and eventually to Mars does not depend on rocket science. It depends on political science."